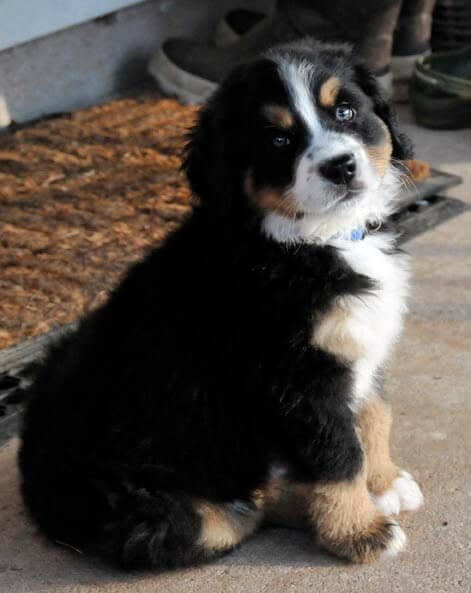 Today this sweet loyal generous companion bodyguard and all around champion of our hearts…is 10 years old !!! 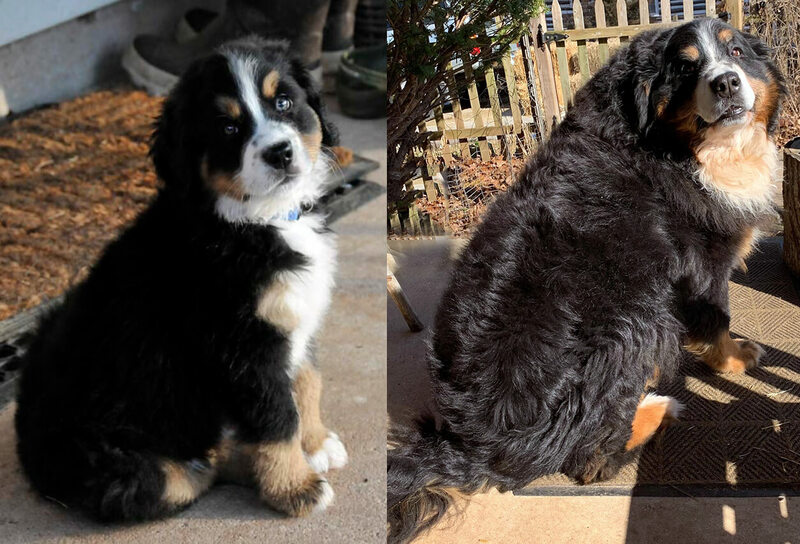 That is a VERY special birthday for a Bernese Mountain Dog. Our little Finnegan is a giver of love. Dear Dear Finn…we love you too. Today Kory and I created our very own Ruth Stout garden bed. everyone was in high spirits to be spending a February day in t-shirts. 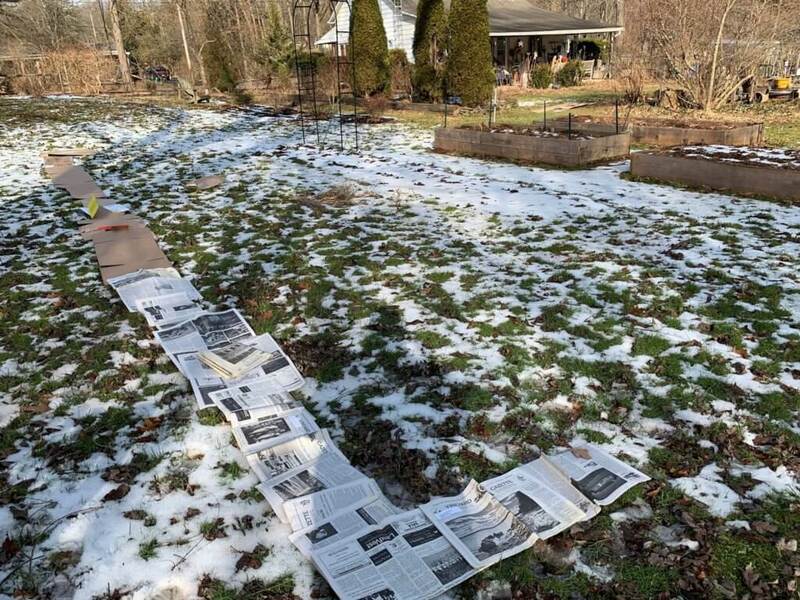 and the stories in the Vineyard Gazette will be whispering to vegetables for years to come. And one of the best parts of the day was watching how much fun Finn had playing in the hay. 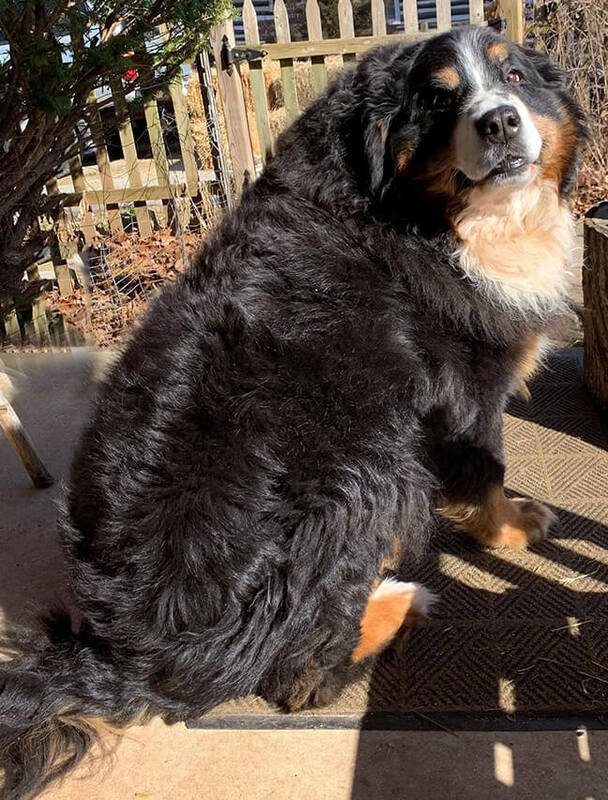 I didn’t get a good picture but she had such a big smile on her face…as if this fluffy soft bed was just a big gift for her. By lunchtime we had almost two thirds completed. Ruth recommended a good 8″ of mulch. 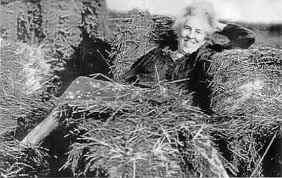 She used spoiled hay because it was cheap since the farmers couldn’t feed it to their animals. 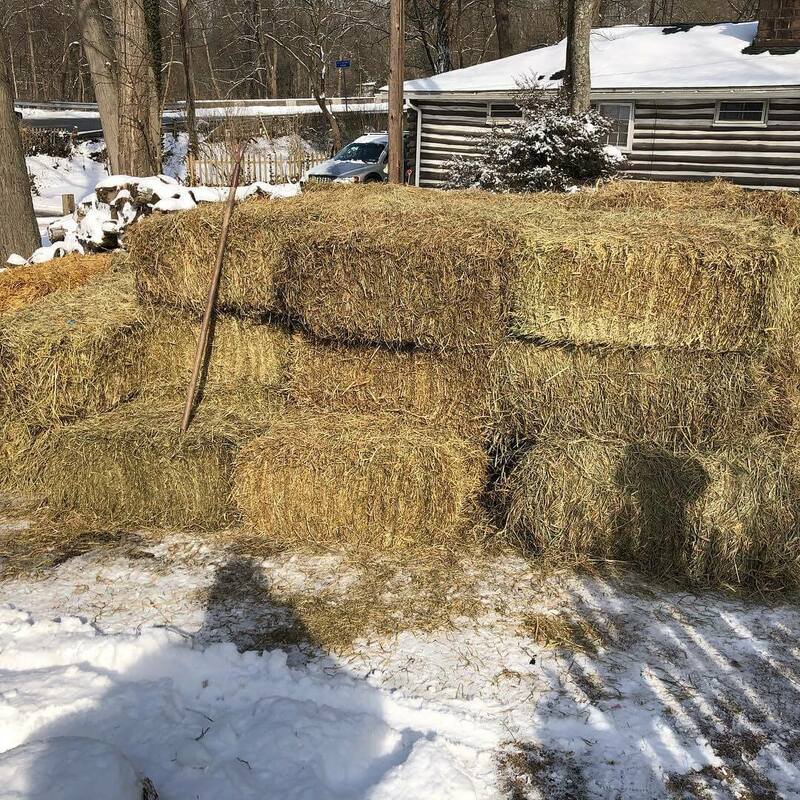 After trying to find a ready source of that around here I decided, as you will recall from my last post, to use the regular bales available at our local supplier…thank you again Homer. 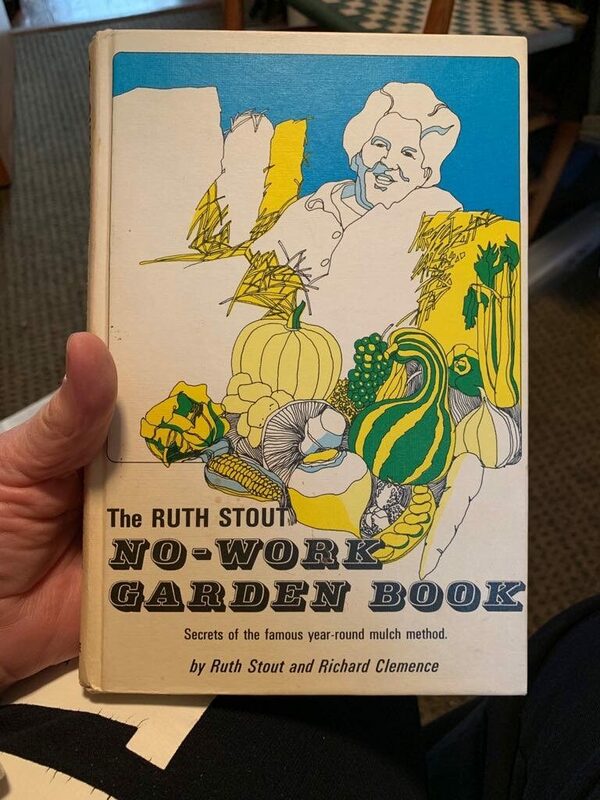 This chronicle is not meant as a how-to, interested gardeners will get much more pleasure out of reading Ruth’s own words of wisdom. I CAN report that there has already been much eyebrow raising, and not a little “mansplaining” from those who have heard of my plan. Originally I had planned to use straw bales as a border, which would provide some structure to run wire rabbit fencing all the way around and then available, directly upon disintegrating, to be tossed onto the mulching bed. But we had much more hay than we needed to start out with so Kory used hay bales along the back edge and Him and Herself fetched another couple truckloads of straw to line the other sides. 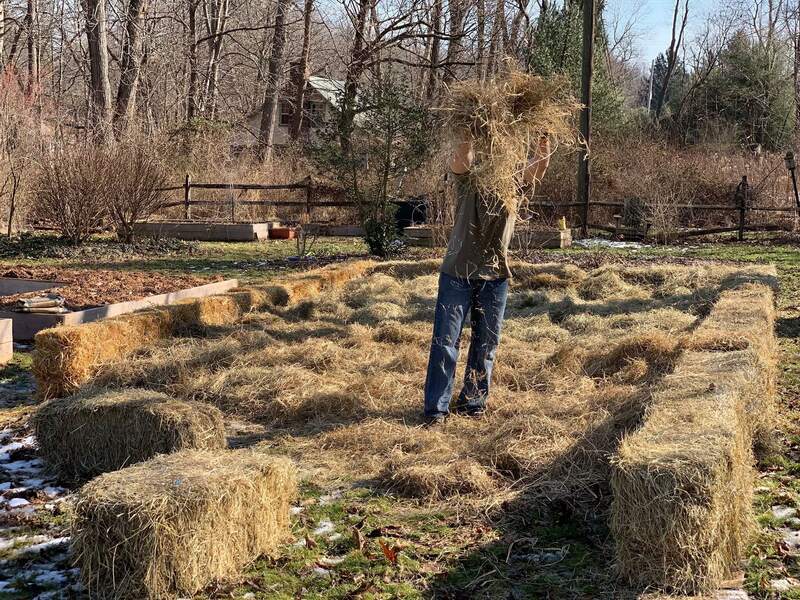 The straw is cheaper and won’t break down as fast as the hay, but all of it, as I repeat myself, will eventually be tossed onto the bed to provide the continuous mulching required to build the soil. 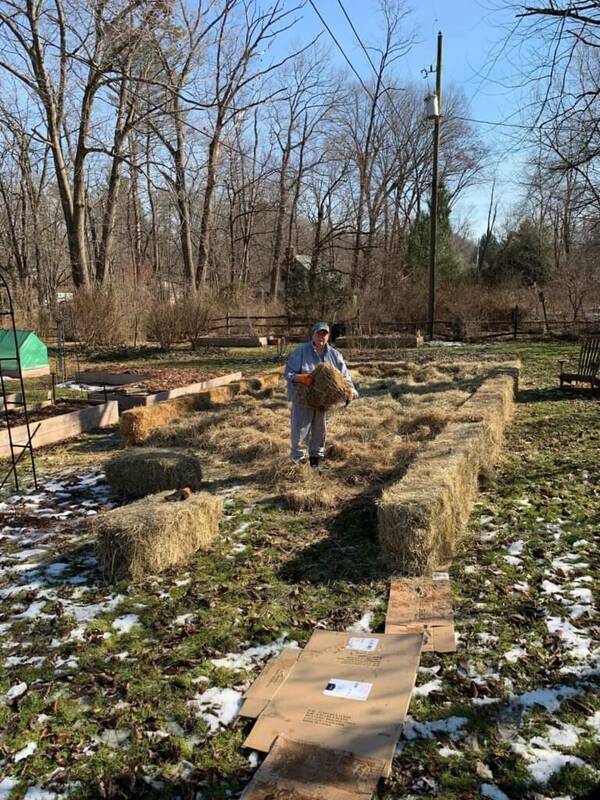 Fun fact…In the past years, when I was experimenting with strawbale gardening, it was quickly discovered that a fully grown studio rabbit is just the right height to reach up and nibble the tenders growing at the top of a bale. 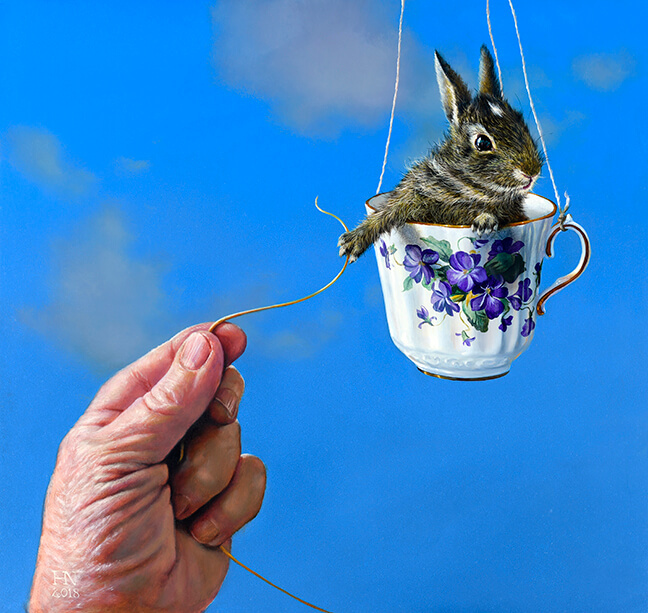 It was simply a glorious day to be outside making those January dreams come alive.. 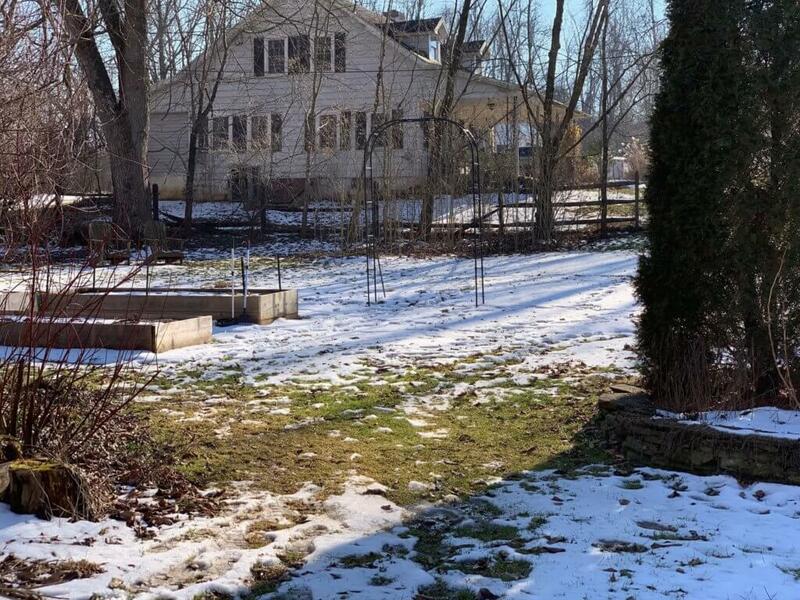 Even though our entire yard is on a sloping angle, this section of the studio yard is full of underground springs and is a devil to mow because it’s a swamp on all but the driest days. One of the benefits of this mulching method is that there should no watering needed. 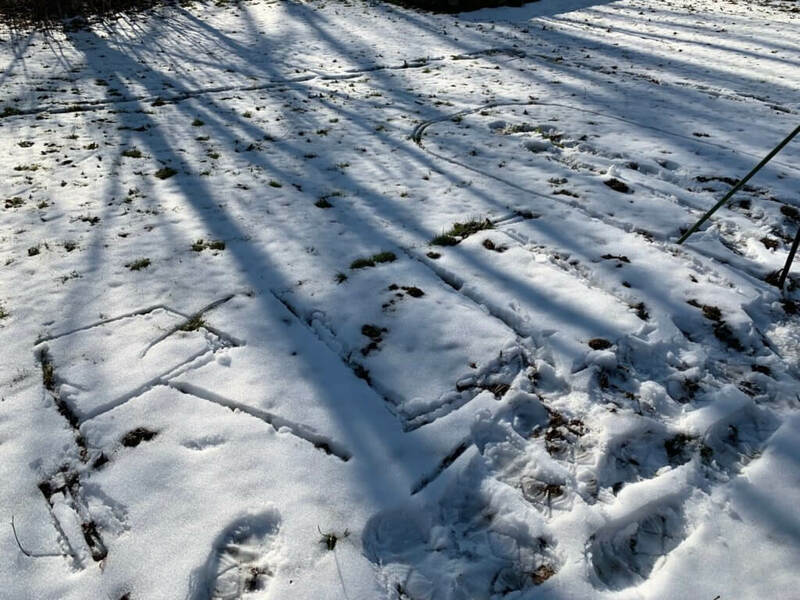 Ruth described setting out a small lawn sprinkler only to give seeds a head start. Time will tell if the mulch will be happy as happy as the rabbits with this arrangement. 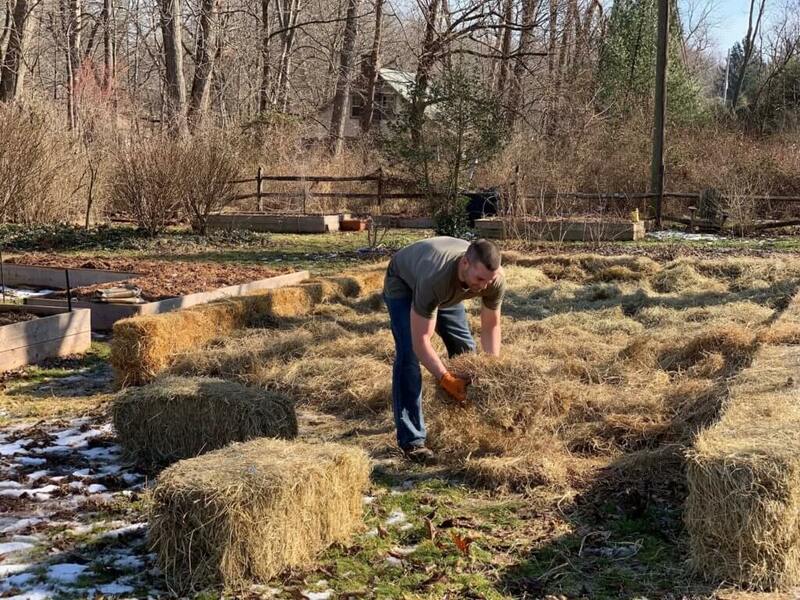 By three o’clock we had finished the large bed, hay mulched a nearby flower bed as an experiment, put straw down between all the raised beds to make muddy spring passage a bit easier, in addition to Kory tackling all of the chores Miss Pat had on her to-do list. 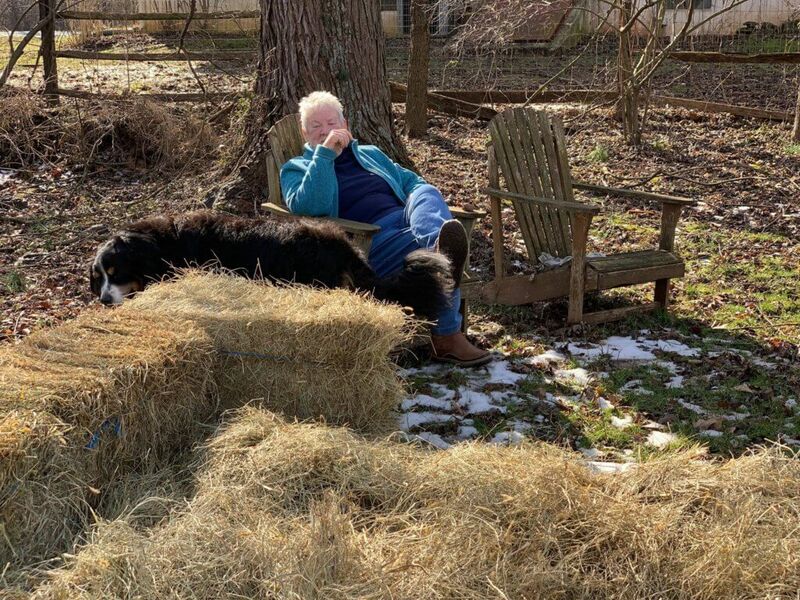 Kory replenished the firewood stack on the log cabin porch, and now we can sit back with our feet up in front of the fire and wait for winter to rain and snow on this creation and for all those lovely earthworms and critters to wiggle their way into Finn’s fluffy bed. 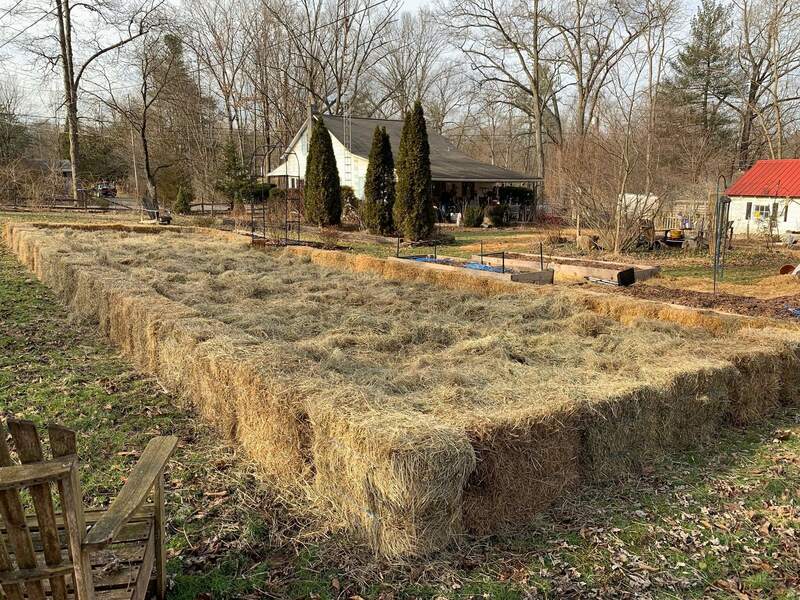 I figure we made a loosely consistent 18″ or so blanket of hay and built a 15 x 50 foot bed. 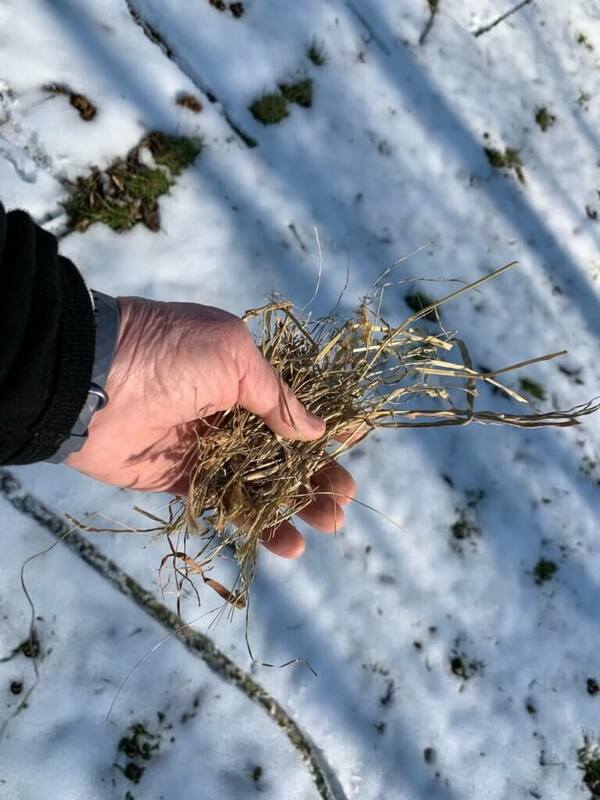 I also figure there are more of these warm weather breaks ahead, and I have a large pile of leaves which we can chop up a bit with the lawn mower and toss on the RS bed (that pile is frozen now). And from now on all of the garden waste and grass clippings will go on there as well. I’ll still keep the compost piles going. We had great success last season sifting many wheel barrows of that home grown gold. 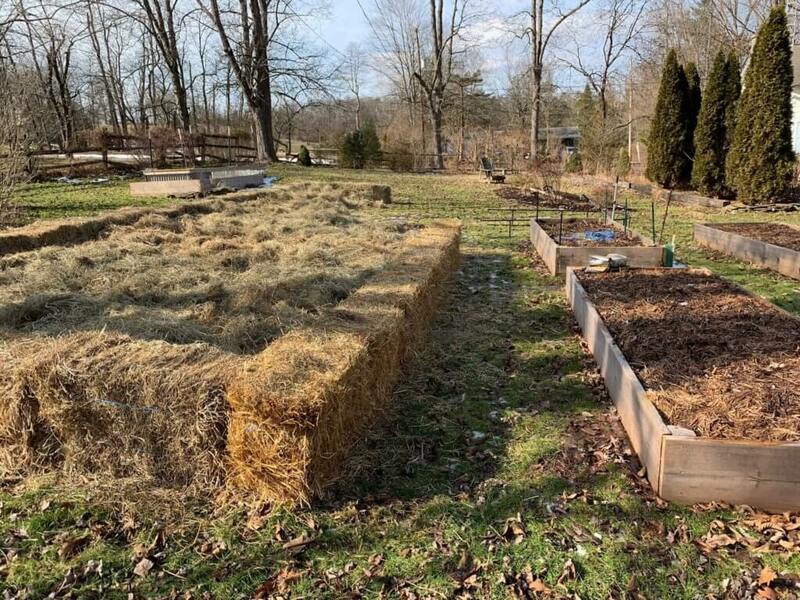 The existing raised beds were put to bed with that gold in the fall so should welcome rotations of deeper root crops this year, and most of the leafy greens and such. Our next project is to replace one of the first raised beds I built, the bottom boards are rotting away. So it will be just the place for a keyhole garden. Oh yes, I am. I’ve designed it to use the same galvanized corrugated aluminum which we used to repair the walls of the asparagus bed last year. 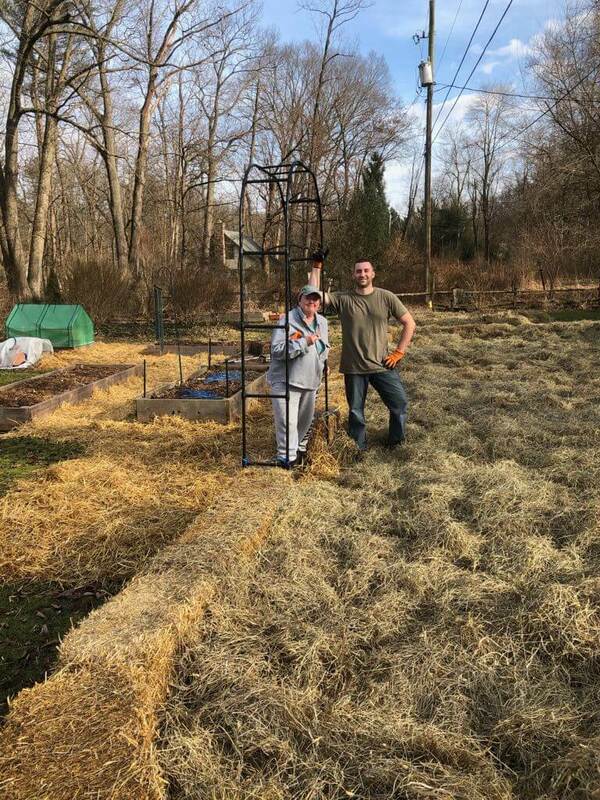 With some tweaking and design updates I’m hoping to improve on our first attempts and make a more permanent structure that can double as a cold frame for winter greens. Stay tuned for more on that. 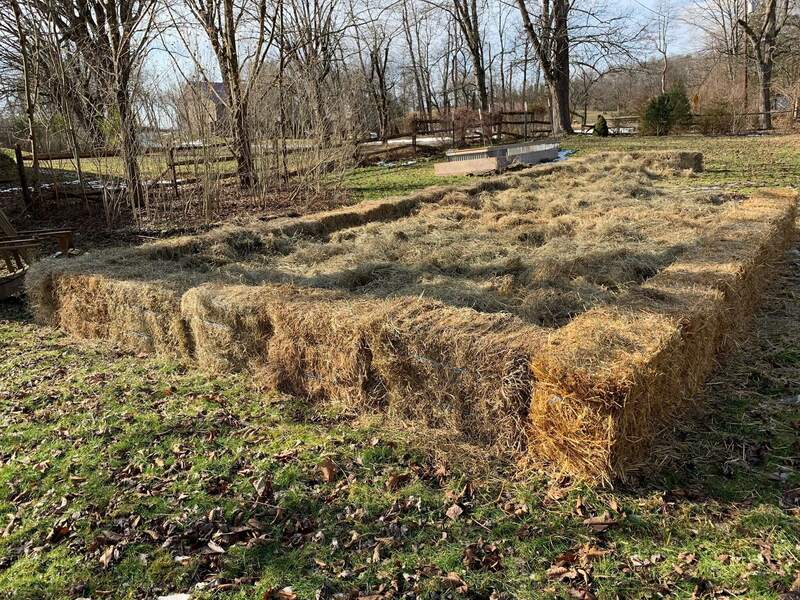 Expectations for the RS bed this year are low because of the time it will take to break all that hay down and begin to build a nutrient rich soil. Others who have tried this report it took a year or more to begin to have soil that would support deeper root crops. OK, so I will be planting potatoes. 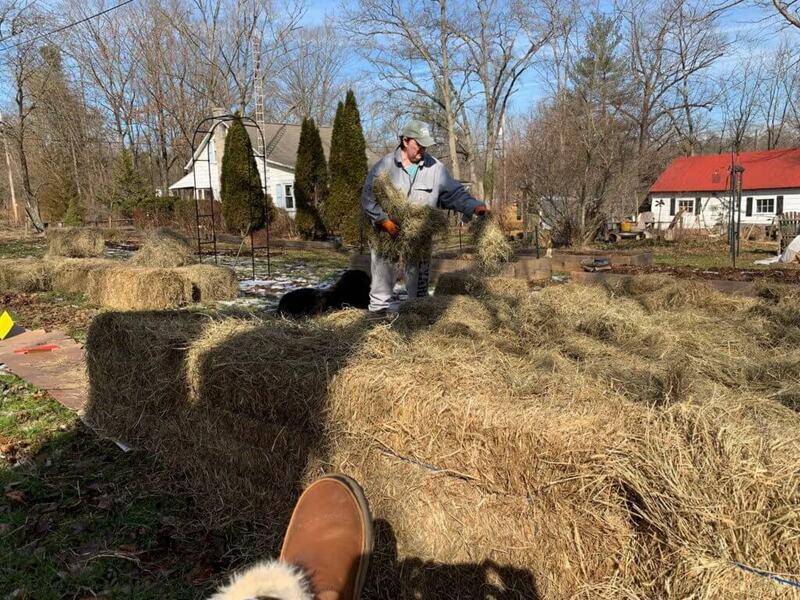 Ruth just pulls back her mulch and throws them directly on the ground and piles the hay back on top. Pretty much the way I’ve been growing them for a couple years so there ya go. Gonna also try onions and leeks, brussel sprouts and kale, shell peas and edamame, and a big section of squash. 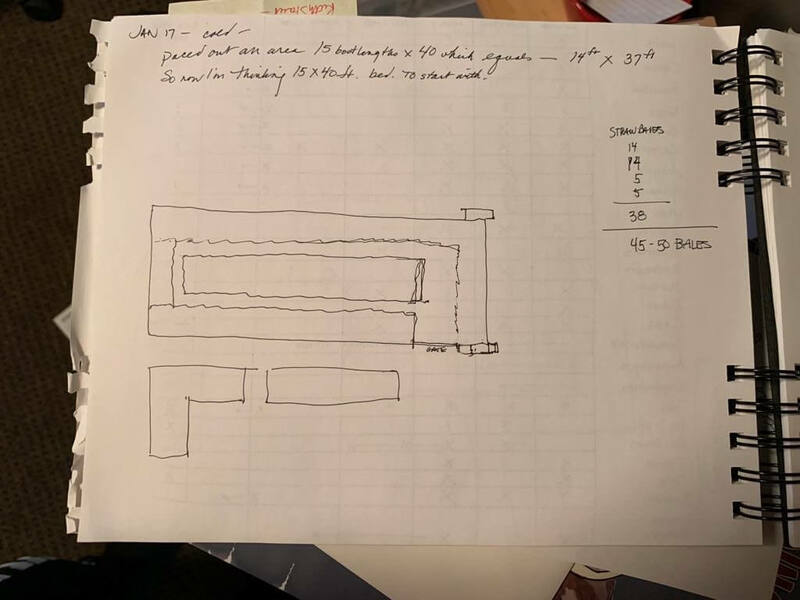 I sow all the seeds I can fit in the studio and the greenhouse so I may start most of the RS bed plants by pulling back the mulch and adding a couple of inches of composted manure and peat before planting the seedlings. 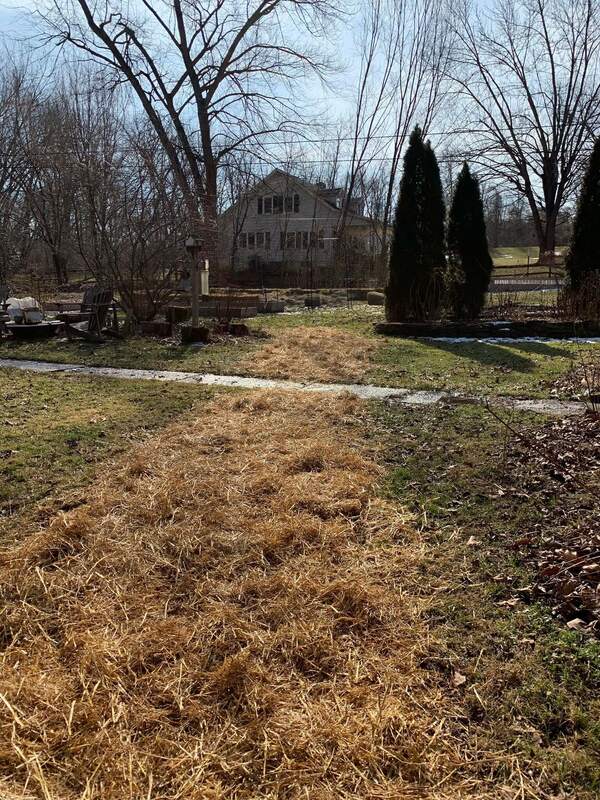 And don’t forget that strawbale border can be planted in as well. Maybe with marigolds and nasturtiums with onions and turnips in between. And a cascade of morning glories for the memorial arch. Ahhh, what an absolute bliss of a gift this day was. Thank you Kory for all that you do for us. These two old ladies are so grateful. 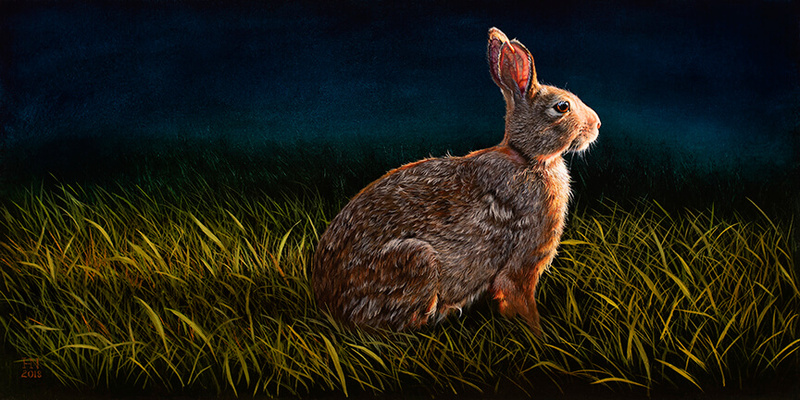 is that I have spent the last month doing my best to paint it. No no, you will have to wait for those pics. I got PLENTY of up close and personal reference material today. Now go and make your own dreams come true. 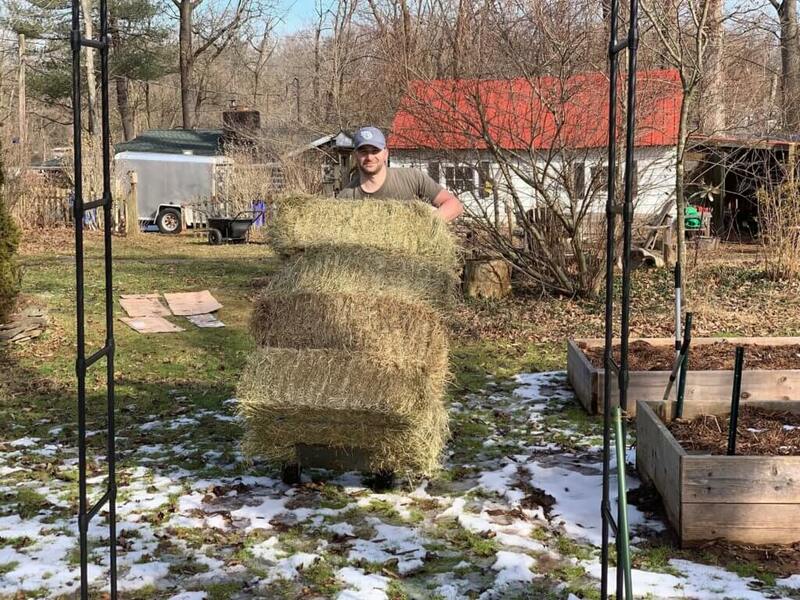 our CSA pals came to the rescue to help us haul 50 bales of hay to the studio today. 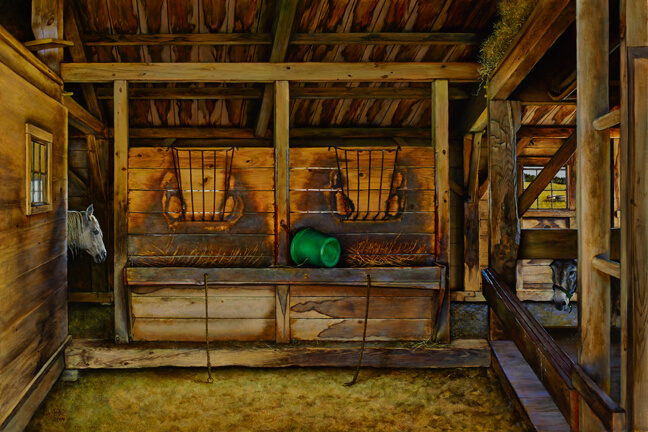 Shout out to Sunnyside Farm…here’s a link to their blog and website. 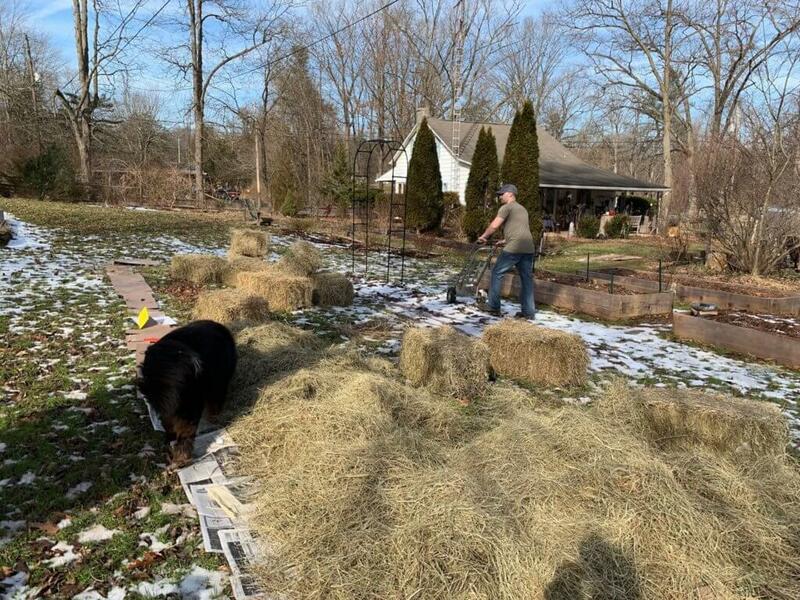 They are about 12 minutes from us and besides being fascinating humans, Dru, Homer and Claire, on their Community Sponsored Agriculture (CSA) farm, harvest acres of veggies, chickens, turkeys, beef, pork and gorgeous flowers. I’m sure that’s not the complete list. We can’t live without their eggs and are thrilled that they have convinced the girls to keep laying throughout this winter ! They have local farm pick up once a week and drive to markets in Hershey and Maryland on a regular basis. Check them out to support your local farmers. You’ll remember reading on this blog recently of the Ruth Stout garden I’m going to establish this year. I’ll be adding regular updates to share the process but today is the beginning. I’ve got three flats of leek and onion seedlings well on their way. They are soaking up the sunshine in the studio patron lounge and will soon be joined by the cold weather startups like beets and chard and carrots when the annual Valentine’s Day studio sowing takes place. This hay wants to be on the ground yesterday, so I’ll get to enjoy the coming warmup as I toss these bales around. Stay tuned and stay frosty out there.